Hadley Cove area at dawn, Hampshire Co., MA. December 17th, 2017. A beautiful hoar-frosted morning with our day starting at a chilly 9 degrees Fahrenheit. Last Sunday, December 17th, I was fortunate (once again) to join Scott Surner for the Hadley sector of the annual Northampton Christmas bird count. Brian Kane and JoAnne Russo joined the crew and after a fairly slow start we rallied to record 55 confirmed species for the day. For the most part it was a chilly day, though this year the weather remained favorable throughout. Of course, we had our share of niggling near-misses with Vesper Sparrow and Common Redpoll on the Aqua Vitae Road, and Barred Owl and Great Blue Heron off River Drive all of which fell just short being confirmed, and somehow Common Raven managed to elude us all day though I had one pursuing Feral Pigeons in the Hadley Honey Pot just two days later! The day was really about the excellent bird finding from all of our team really beginning with a Lapland Longspur picked up by Brian in the Hadley Honey Pot. After that, we had a nice run of scarcer species with Merlin, Gray Catbird, Winter Wren and American Pipit all in the Honey Pot, a calling Red-shouldered Hawk off River Drive, and Snow Goose and Field Sparrow at the end of Meadow Street (restricted access). Locally high tallies for the day included five each of Belted Kingfisher and Pileated Woodpecker, and no less than three Eastern Screech-Owls! Bird of the day would have to be American Tree Sparrow which greeted us in numbers at just about every stop we made. It was a fabulous day, and gracious thanks go to Scott, Brian and JoAnne for making it so enjoyable. Red Fox - Hadley Cove, Hampshire Co., MA. December 17th, 2017. The first good spot of the day, JoAnne found this one in a backyard at dawn. Scott Surner and JoAnne Russo - Aqua Vitae Road, Hadley, Hampshire Co., MA. December 17th, 2017. Trying hard to pin down a Common Redpoll heard by me and seen briefly by JoAnne. Lapland Longpsur with Horned Larks - Hadley Honey pot, Hampshire Co., MA. December 17th, 2017. This bird marked a turning point in our the day. Remarkably, it was the only Lapland Longspur seen during the entire Northampton Count. Gray Catbird - Hadley Honey pot, Hampshire Co., MA. December 17th, 2017. Showed well to all of our team, and one of only four to be recorded on the overall Northampton count. Winter Wren - Hadley Honey pot, Hampshire Co., MA. December 17th, 2017. First picked up on call by Scott Surner, this turned out to be one of just two recorded for the whole count. Pileated Woodpecker - Hadley Cove, Hampshire Co., MA. December 17th, 2017. First one of five seen/heard during the day. An excellent showing of this species for our sector along the Connecticut River. Northern Harrier (juvenile) - Hadley Honey pot, Hampshire Co., MA. December 17th, 2017. The only harrier of the day for us. Brian Kane - Hadley Honey pot, Hampshire Co., MA. December 17th, 2017. Working the fields for sparrows - fully committed! Black-capped Chickadee - Hadley Honey pot, Hampshire Co., MA. December 17th, 2017. I noticed this one taking Sumac fruit when I had a quiet moment away from my field companions. Snow Buntings - Hadley Honey pot, Hampshire Co., MA. December 17th, 2017. A good day for this species with over 80 seen. Merlin (male) - Hadley Honey pot, Hampshire Co., MA. December 17th, 2017. Red-shouldered Hawk (juvenile) - River Drive, Hadley , Hampshire Co., MA. December 17th, 2017. We had good views of this calling bird only realizing afterwards that it was mobbing something below it - Scott and JoAnne noticed 'something' slipping away underneath the hawk that was probably a Barred Owl! One of seven Red-shouldered Hawks recorded on the Northampton count, a surprisingly good tally and a new count high. Field Sparrow - Meadow Street, Hadley, Hampshire Co., MA. December 17th, 2017. A great spot by Scott and the last good bird of the day. Like the longspur, it turned out to be the only one recorded on the entire Northampton count. American Tree Sparrow - Hadley Honey pot, Hampshire Co., MA. December 17th, 2017. Barrow's Goldeneye at dusk - Turner's Falls, Franklin Co., MA. December 5th, 2017. A fine male Barrow's Goldeneye showed up at the Turner's Falls power canal on Dec 5th - a very wet, misty, gloomy evening, so misty in fact, that it was difficult to glean anything on the power canal without a high resolution scope. But I got lucky and found a raft of some 80 Common Goldeneyes and soon focused on the Barrow's after checking only five or six birds. It was a bold, perky male consorting with the displaying Common Goldeneyes and doing plenty of display of his own. The previous five winters have been pretty good for seeing male Barrow's Goldeneyes in the greater Turner's Falls area and it's difficult to say if this bird is a returning male, though it does seem rather likely. Barrow's Goldeneye at dusk (second from left) - Turner's Falls, Franklin Co., MA. December 5th, 2017. December 5th also brought the first major Horned Lark (125) and Snow Bunting (42) flocks to northern Franklin County with both species staying all-too-briefly at the excellent Pauchaug WMA area in Northfield. Winter Wrens continue to show up in the mild conditions with birds at Gill Town Center (2), Gill Elementary School and Unity Park in Turner's Falls as well as continued birds along North Cross Road in Gill. Winter Wren - Gill, Franklin Co., MA. December 2nd, 2017. Snow Buntings - Pauchaug Brook WMA, Northfield, Frnaklin Co., MA. December 5th, 2017. Horned Larks - Pauchaug Brook WMA, Northfield, Frnaklin Co., MA. December 5th, 2017. 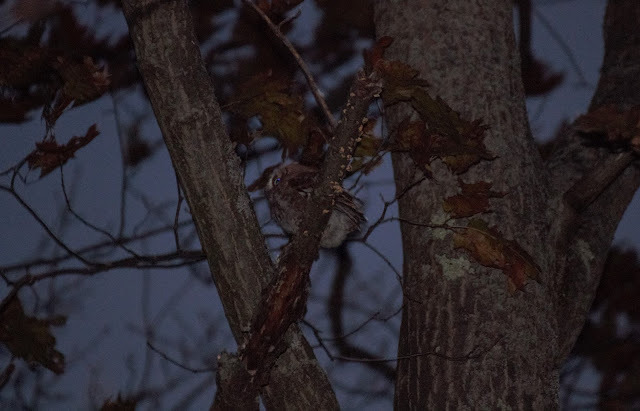 It's been another good week for owls locally with the discovery of a pair Eastern Screech-Owls at a new site in Gill, and continuing vocal birds at traditional spots in Gill and two sites in Turner's Falls. Great Horned Owls can be heard on calm evenings around Gill Town Center and on December 5th, I chanced upon a roadside Barred Owl in the rain, again in Gill. Barred Owl in the rain - Gill, Franklin Co., MA. December 5th, 2017.